Called to the home of her fiancé Calder Hart’s former mistress late one night, amateur sleuth Francesca Cahill’s curiosity is piqued. But upon arrival, she is shocked to find Daisy Jones’s bloodied body—and even more devastated when the evidence points to one suspect—Calder. Francesca cannot—will not—believe that Calder is capable of such an act. Still, she is unable to shake her instinctive sense that Calder is lying about *something*. The police are far less inclined to believe his innocence, and Calder is arrested for Daisy’s murder. But Francesca’s heart is not easily swayed…until a life-altering secret is exposed that could destroy their future together. 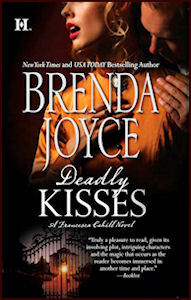 Listen to a audio clip from Deadly Kisses, on sale March 25, 2014 from Audible, an Amazon company. Francesca leaned eagerly forward in the hansom she had hired. Stealing out of the house at the midnight hour had been easily accomplished, with her father still in the library and her mother upstairs and presumably gone to bed. The doorman, Francis, had pretended not to see her escape, but then, she had begun to give him a weekly gratuity to insure his looking the other way at such important times. Finding a cab at this late hour had been easy enough, as well. The prestigious Metropolitan Club was but a block south of the Cahill home. There, she had merely to wait for an arriving gentleman to appear. Traffic was light as it was a Monday night, but this was New York City, the city that never slept, and eventually a hansom had paused before the club’s imposing entrance to discharge his fare. Not wanting to be recognized, Francesca had ducked her head as a gentleman had paid the cabbie and walked past her to the building’s entrance. Francesca knew he stared with some real curiosity, as genuine ladies did not travel about the city at such an hour alone. Francesca trembled now, clinging to the safety strap and straining to glimpse Daisy Jones’s residence as her cab rumbled towards it. She simply could not imagine what Rose could want—and at such an hour of the night. Daisy Jones was Hart’s ex-mistress. She was one of the most beautiful women Francesca had ever seen, and the day they had met, she had also been one of the city’s most expensive and most sought after prostitutes. Hart had been a suspect in the murder of his father, a man he had only recently met. Francesca had been on the case, although at that time she barely knew Hart. In fact, she had been working closely with his half-brother, Rick Brag, the city’s police commissioner. Hart had claimed to have been in Daisy’s bed the night of Randall’s murder. The alibi had been a lie, but eventually, Francesca had found the real killer. Hart had asked Daisy to become his mistress shortly after that investigation, and she had agreed. Francesca had not been surprised when she had learned of the liaison, as she understood why Hart would want to keep such a woman. In fact, she and Daisy had become rather friendly during that investigation—but any friendship had vanished when Hart had asked Francesca to marry him. Hart had jilted Daisy. She had not been pleased. The large Georgian mansion appeared in her view. Francesca inhaled, absolutely unable to imagine what trouble Rose could be in—and at such an hour, she did not delude herself, it could only be trouble and little else. Daisy did continue to reside in the house Hart had bought for her, as Hart had promised her a six month commitment and he was honoring at least that portion of their agreement. Francesca thought but was not sure that Rose was now living there, too. Rose was Daisy’s dearest friend–and she had been her lover before Daisy had left her for Hart. The hansom had stopped. Francesca reached for her purse, now noting that the entire downstairs of the house was dark, except for the outside light, and two upstairs windows were lit. Alarm bells went off in her mind, as nothing could be odder. Even at such a late hour, a few lights should remain on inside on the ground floor. Francesca paid the driver, thanking him and stepping down to the curb. She paused to stare carefully at the square brick house as he pulled away. There was no sign of movement, but then, at this hour, she did not expect any. Uncertain of what to expect, she pushed open the iron gate and started up the brick path leading to the house. The gardens in front were lush and well tended and Francesca cautiously scanned them. Her nerves were on end, she realized, and she almost expected someone to jump out at her from behind a shrub or bush. And just as she was about to silently reassure herself, she noticed that the front door was open. Francesca hesitated, fully alarmed now. And suddenly she thought about her mad dash from home, a dash in which she had not bothered to go upstairs to retrieve her gun, a candle or any of the other useful items she habitually kept in her purse. She made a mental note to never leave home without her pistol again. Francesca glanced inside the house. The front hall, which she knew fairly well, was cast in black shadow. She slowly pushed the front door open and the hairs on her nape prickling, she stepped in. And she had a very bad feeling, oh yes. Chills swept up and down her spine. Where was Daisy? Where was Rose? And where, in God’s name, were the servants? Francesca moved quietly to the wall, groping for the side table she knew was there. And pressing against it, she strained to listen. Had a mouse crept across the floor, she would have heard it, for the house was so achingly silent. She desperately wanted to turn on a gas lamp, but she restrained herself. Francesca waited another moment for her eyes to adjust to the darkness and then she crept forward. A dining room was ahead and to her right. Francesca opened the doors, wincing as the hinges seemed to groan, but the large room was dark and vacant. She did not bother to shut the doors and quickly crossed the hall, glancing nervously at the wide, sweeping staircase as she passed it. At some point she would have to go upstairs. The closest door was to the smaller of the two adjoining salons and it was ajar. Francesca pushed it open. As she had thought, that room also appeared to be empty. She briefly paused, swept back to another time when she had stood in that room, her ear pressed to the door that adjoined the larger salon, spying upon Hart and Daisy when she barely knew Calder. But even then, his appeal had been powerful and seductive; even then, she had been drawn to him as a moth to a flame. That day she had heard what she had secretly wanted to hear, but she had seen far more than she should have. She had been audacious enough to watch Hart make love to his mistress. Such an intrusion on their privacy had been shameful, and Francesca knew it, still, she had been incapable of stopping herself. She shook the recollection off. That had been months ago, before she had ever been in Hart’s arms, when she and Daisy had genuinely liked one another, before Hart had cast Daisy aside—before she and Daisy had become enemies and rivals. None of that mattered, now. Something was amiss, and if Daisy or Rose were in trouble, Francesca intended to help her. She left the salon the way she had come in. And the moment she stepped back into the hall, she heard a deep, choking sound. Francesca froze. She stared at the wide staircase facing her, straining to hear. And she heard the guttural emission again, and this time, she felt certain it was a woman. The noise had not come from upstairs, but beyond the staircase, somewhere in the back of the house. She had never been down that corridor but knew that the kitchen would be at the very back. Francesca wished she had a weapon, never mind that she felt that her prey was wounded and in pain. And now she saw a flickering light, cast by a candle, coming from a small room just ahead. She quickly discerned that it was a study, for the door was widely open, revealing a vacant desk, a sofa and chair. Francesca rushed to the threshold and saw Rose. For Rose was sitting on the floor, hunched over another form, a woman, whose platinum hair could only belong to Daisy. Rose was moaning, the sounds long, deep and low and filled with grief—as if her dear friend was dead. But surely Daisy was only hurt! Francesca ran forward and saw that Rose held Daisy in her arms. Daisy was in a pale satin supper gown—and it was covered with brilliantly, shockingly red blood. Francesca dropped to her knees and finally saw Daisy’s beautiful face—and her wide, blue, sightless eyes. Rose moaned, rocking her, again and again. Francesca was in shock. Daisy was dead. And from the look of things, she had been murdered, perhaps with a knife. Horror began as she realized the extent of the wounds on Daisy’s chest. Who would want her dead, and why? And Francesca recalled the last time she had seen Daisy, when she and Rose had appeared at the funeral of a murder victim during Francesca’s most recent investigation. There had been no reason for her to attend, except one—to taunt Francesca. For Daisy had made it clear that she felt that Hart would never remain loyal to any woman, much less Francesca. She had been hostile and bitter over the end of her own affair, and she had clearly wanted Hart back. She had done her best, in fact, to cause tension between Hart and Francesca, and she had wittingly played upon all of Francesca’s insecurities. That day, outside of the church, she and Daisy had exchanged harsh words. Francesca could not remember the exact conversation, but she had been upset and dismayed—she had felt threatened by the other woman, precisely as Daisy had planned. Daisy had been a terrible source of conflict recently, she had maliciously done her best to hurt both Francesca and Hart, but dear, dear God, she had not deserved this. And the questions returned. Who would do this—and why? Rose froze, slowly looking up. Her green eyes were glazed with misery and tears. She shook her head, unable to speak. Francesca quickly closed Daisy’s eyes, shivering as she did so. She would never become accustomed to death, and especially not violent death. She glanced at her chest and fought not to gag. Daisy was impossibly fair, blue eyed, with platinum hair, her skin the color of alabaster. She was also delicate and petite, with a sensuous grace that could only be inherent, never achieved. Now, her small bosom was a mass of bloody, gaping flesh. Francesca stood, shaking, and decided against turning on more lights. The murder had been a brutal one. Rose did not need to be confronted with the extent of Daisy’s wounds. Francesca took a soft cashmere throw from the sofa, continuing to tremble. She was ill, very much so, and she inhaled raggedly for control. “I will find out who did this,” she whispered, aching for Daisy now. Rose looked up accusingly. “You don’t care! Don’t pretend that you care! We both know you hated her because Hart took care of her. I know you hated her ever having been in Hart’s bed!” Rose cried. Rose shook her head, choking, hugging Daisy more tightly. Francesca stared. Rose was as dark, voluptuous and tall as Daisy was fair, slender and petite. Now she was covered with her friend’s blood. “I need to go to the police,” she said, instantly thinking of Rick Bragg. He was far more than the city’s Police Commissioner, he was Hart’s half-brother, and once, they had been in love. Francesca needed him now. Together they would find Daisy’s killer. They made an excellent team—they had solved a half a dozen dangerous and difficult cases together. He remained her good friend. It was late, but he had to be summoned immediately. And she thought about Hart, his dark, smoldering image coming to mind. He might not have ever loved Daisy, but how would he react to her murder? Francesca realized she would be the one to tell him of the death of his former mistress, and unfortunately, she would have to do so the moment he returned home. Rose nodded. “The Police? !” She was scathing and bitter. “We need to find Daisy’s murderer! I am hiring you, Francesca, to find the killer. Forget those damned leather heads! They won’t give a damn about Daisy,” she said, and she began to weep all over again. Francesca nodded, her instincts warning her not to take on Rose as a client. She took the opportunity to kneel and cover Daisy’s brutally disfigured body with the throw. Somehow she pulled Rose to her feet, putting her arm around her. “Please. Come sit down in the salon,” she said, wanting very much to get Rose out of the room. But Rose balked. “No. I am not leaving her here, alone, like this!” And the tears streamed. Rose swallowed. “I don’t know. I was out for the evening—when I got here, the house was dark. I knew something was wrong! I called for her—but she didn’t answer.” And Rose stopped. For out in the hall, a soft bump had sounded. Stiffening, Francesca looked at the open door, as did Rose. But the hall beyond was lost in shadow and she saw nothing—and no one. But she had heard a noise—someone was present. “The butler sleeps in his room behind the kitchens, as does the maid. The housekeeper goes home at five.” Rose was ashen and wide-eyed now. Rose shook her head. “No. I was about to go upstairs when I saw the light coming from this room.” Her mouth trembled and she glanced at Daisy’s covered body. She inhaled, clearly fighting more tears. “Wait here,” Francesca said. She glanced at the desk, saw a letter opener and took it. Then she changed her mind, putting it back and taking a crystal paper weight instead. After what had been done to Daisy, she did not think she could stab anyone. Of course, it was up to the coroner to decide if Daisy had been stabbed. Rose hadn’t answered. Francesca did not care. Clutching the paper weight, she left the study. The corridor outside remained dark and now, every blond hair on her nape prickled with dread and fear. Someone was lurking in the corridor leading to the kitchen and servant’s quarters. Francesca didn’t assume it—she knew it. But it would make little sense for that someone to be the killer. The killer must have long since fled. It was probably just a servant. On the other hand, murderers often defied every possible assumption one might make about them. Francesca took a deep breath for courage, once more wishing she had her gun, and she started stepped into the hall, trying to make as little noise as possible. And Francesca heard footsteps approaching—each footfall slow and cautious. She froze. Her grip on the paperweight increased. She debated turning to flee, but in a moment whoever was beyond her would appear and see her. Instead, she pressed against the wall, waiting. And the shadowy form of a man appeared. He was carrying a candle—he saw her against the wall, halted in mid-stride and lifted the candle higher. Francesca was illuminated—but so was he. And standing there in the hall was her fiancé.